navy school sweatshirt or cardigan with the school logo. Summer wear could include white, blue or grey t-shirt/polo shirt and shorts in plain colours, i.e. white, blue or grey but not patterned beach wear or cycle shorts. 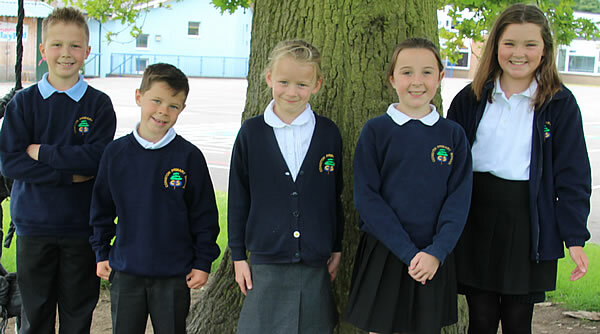 Uniform can be purchased from the school office, along with PE kit, book bags, jackets and a water bottle. An order form with more information is included in the Reception welcome pack. The uniform is sold by the school on a non profit making basis and is very reasonably priced. Any items/sizes not in stock are ordered on a Friday and are received the following Friday. The only exception to this will be during school holidays and peak times at the beginning of the academic year (September). Jewellery is not to be worn to school – the only exception to this is the wearing of ONE stud in each ear. These ear-rings must be removed for any PE activity, with the only exception being recently pierced ears. No ear-rings are allowed for swimming. 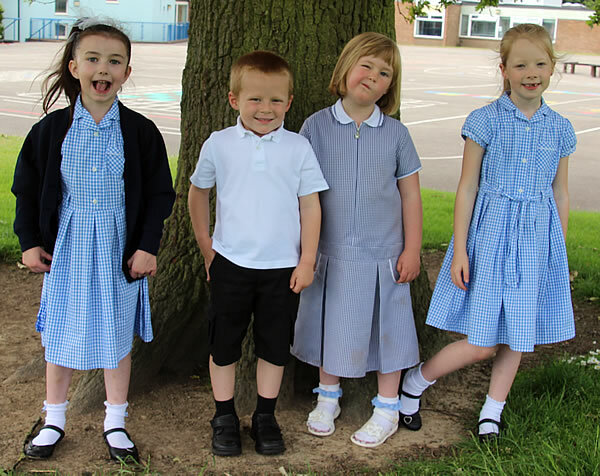 Our wonderful children are modelling sweatshirts and cardigans with logos, black and grey trousers, black and grey skirts, white and blue shirts and blouses, black shorts and checked summer dresses. Don’t they all look smart!